Soffit is comparable to vertical siding, and its installation entails more than the actual panels. It protects the underside of eaves and porch ceilings and can provide a hidden vent system. Aluminum and vinyl are the predominant materials, and they are available in solid, fully perforated or lanced, or combination soffits. 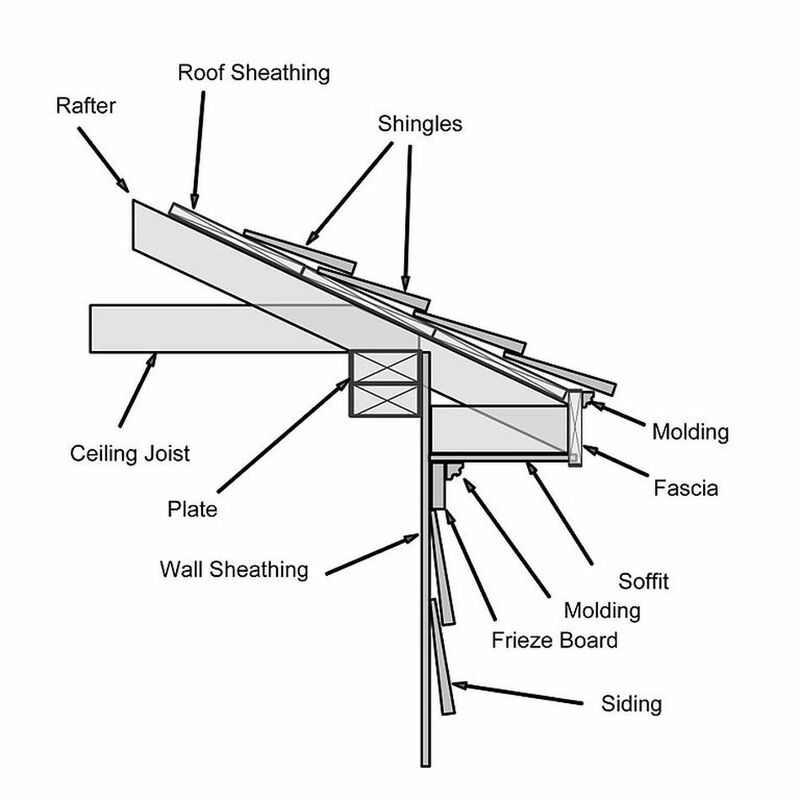 Measure and calculate the total square footage needed for the areas requiring soffit. Panels come in 12-foot lengths that are either 12 or 16 inches wide. Therefore, a panel that is 12 inches wide equates to 12 square feet, and a panel that is 16 inches wide equates to 16 square feet. Plan on purchasing enough soffit to cover about 5 percent more space than necessary to account for waste and overlaps. Check surfaces to make sure they are uniform and straight. Reattach any loose boards or shingles that might affect your installation procedure. Identify possible obstructions such as utility lines. Panels may be cut to fit around them, or you can contact your utility company for removal or replacement. Remove gutters. This can be cumbersome and difficult to do without damaging the gutters. If you plan to replace the gutters anyway and are not worried about damaging the old ones, this process goes much faster. F-channels or J-channels can be used as receiving channels, and they should be attached by nails every 12 inches along the wall. When the soffit turns a corner, the channel then needs to be installed with a 1/4-inch gap that can allow for expansion at the walls. Do not overdrive fasteners. Measure from the wall to the fascia and subtract half an inch to allow for movement. Cut the panels to the determined size. A circular saw works best, and you can cut two panels at once to expedite the process. Insert the soffit panel into the channel. Make sure the panel forms a 90-degree angle with the wall. Repeat these steps for each panel. Be sure the tongues and grooves of each panel line up with the panels alongside them. Once all panels have been installed, apply utility trim and fasten using trim nails. You can also drill holes for the trim nails to reduce denting of the aluminum.